The Prineville-Crook County Chamber of Commerce is starting a charming new program. It's called the Prineville Charm Trail, and the idea is to entice tourists into shops, where they can purchase small bracelet charms that represent those businesses. 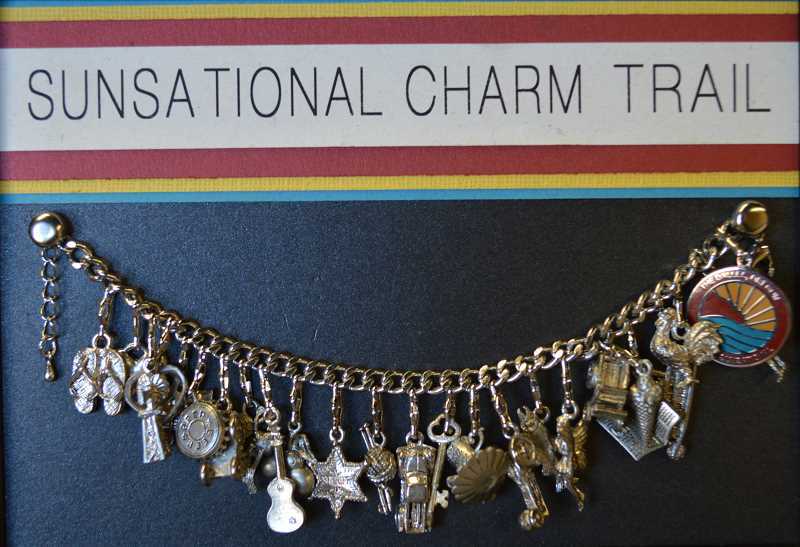 Once shoppers visit all participating businesses on the Charm Trail Map, they will have a complete charm bracelet, featuring dangling half-inch metal charms such as a covered wagon, a flower and a cowboy boot. "The whole idea behind this program is trying to get people to visit businesses they might not otherwise frequent," said Chamber Executive Director Kim Daniels. "They buy a charm, and they end up having lunch, too, or they buy a charm but then they see what else is for sale." Local chamber members who would like to sign up for the program must contact the chamber office by the Wednesday, Oct. 17 deadline. Shoppers can start looking for charms in participating stores Nov. 1. "The program has proven very successful in The Dalles and Eastern Oregon and is growing around the country as shoppers get into the habit of collecting attractive charms," Daniels said. "We had several people come into the chamber that had done this in other towns." They researched the program and found that several other towns in Oregon do this. Redmond businesses are part of a Holiday Charm Stroll each November, while Pendleton and The Dalles have year-round charm trails. Several Willamette Valley wineries and attractions created the Tri-County Charm Trail. The chamber staff connected with The Dalles Area Chamber of Commerce, where the program has been successful. "They supplied us with everything we would need to do to get the program going for ourselves," Daniels said. The investment for businesses to participate is $125, which includes an initial one-year participation fee of $50. The chamber will provide the charms, maps and a window cling they can display to let shoppers know they are part of the Charm Trail. The bracelets are sold for $5, and charms are typically sold for $1.50. "If all are sold, the business ends up with a positive return on investment and increased foot traffic and peripheral sales," Daniels said. Charm Trail shoppers will purchase their bracelets at Trailheads, which are a select few businesses that sell the bracelets. Locally, Trailheads include the Prineville-Crook County Camber, Terry's Jewelry and Mountain Girl Designs. So far, 13 local chamber members have bought into the Charm Trail program and have selected metal charms to represent their businesses. A flower charm will represent The Posie Shoppe while Shasta Leatherworks chose a chaps charm. A covered wagon charm represents the Bowman Museum, golf clubs represent Meadow Lakes, and Pine Theater chose a film projector. Maps that highlight all participating Charm Trail businesses will be available at each of the shops. "Our plan right now is to only let businesses sign on once a year," Daniels said, noting the cost of updating the map and the advantage of buying in bulk. Charm Trail participants must commit to one year with the program. Businesses will be able to sign up again for one year next September. When the Charm Trail kicks off next month, shoppers can either pay for the charm or donate a nonperishable food item. Food donations will be given to Christmas in the Pines, who then donates to the Holiday Partnership. Daniels and the participating Prineville Charm Trail businesses hope the new program will spur some interest in their shops. "One gal that came into the chamber said that she and her girlfriends actually sometimes will plan their trips around the state to the communities that have these because they want to get a bracelet from every city in Oregon," Daniels said. "So what it does, is it adds to our tourism, too."